OPC An OPC Classic Server supporting Data Access (DA), Alarm and Events (AE), Historic Data Access (HDA). 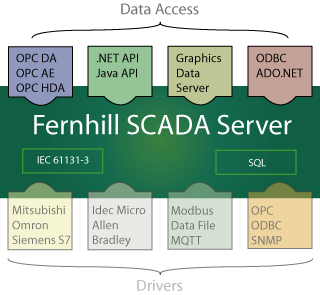 ODBC An ODBC Driver allowing direct integration of SCADA data with front and back office applications. ADO.NET A .NET Data provider. .NET API A .NET API to allow Common Language Runtime programs to access SCADA data. Java API A Java API to allow Java programs to access SCADA data.